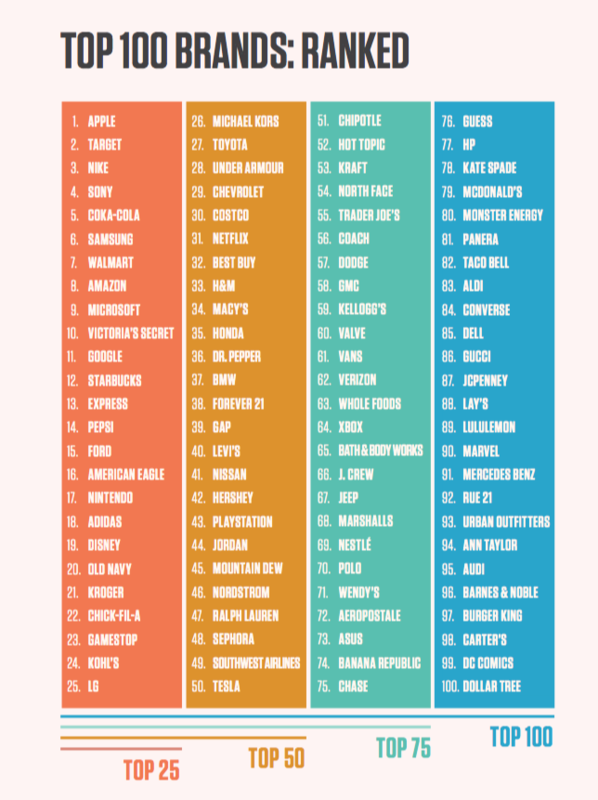 US ad agency and Gen Y specialists Moosylvania has revealed its annual list of the top 100 brands loved by Millennials and once again Apple has topped the list. Now in its eighth year, the agency asked more than 1,500 Millennials — defined as 16 to 36-year-olds — to select their three favourite brands completely unaided. Obviously the participants were Americans and the results have a US-bias. However, it was very good news for brands that may have typically struggled or failed to capture the imagination of the Ys. Retailer Target came in at an impressive second spot, Coke at five, Walmart at seven and Starbuck’s at number 12. The list, as you’d expect, was dominated by tech firms and retailers. Proving, yet again, the Ys like to Snapchat and shop.